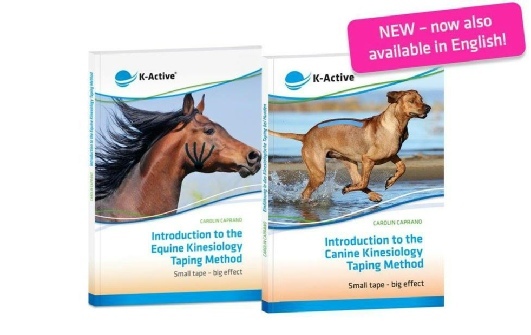 The guides „Introduction to the Equine Kinesiology Taping Method“ and „Introduction to the Canine Kinesiology Taping Method“ are primarily aimed at animal therapists and interested horse and dog owners who have a basic knowledge of horse anatomy and pathology. 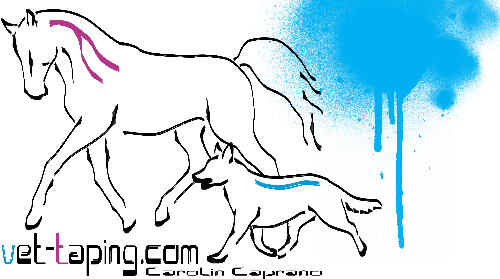 The history and theoretical knowledge will be taught and the implementation of the techniques specifically to the horse or dog will be practiced. The reader gets a practical instruction by many photos and case studies. Horses and dogs benefit from the effects of the tape the same way humans do. The tape has a good adhesion on the relatively short and flat coat. It lifts up the hair gently as well as the underlying skin. The K-Active tapes consist of a highquality cotton fabric. They are coated in a sinusoidal form with a special acrylic adhesive. The tape resembles the skin in terms of thickness, extensibility and weight. An advantage of the kinesiology tapes as opposed to the common classic sports tapes is that a full range of motion and the capacity of the capillaries are maintained.